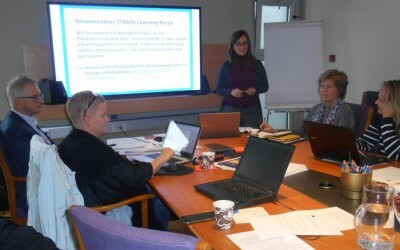 The TTRAIN project aims at improving the qualifications of employees in the tourist sector by creating a strong and comprehensive learning model/curriculum for vocational instructors who provide on-the-job-training to their colleagues. The learning model will take into account the specific requirements and situations in each partner country – Austria, Finland, Iceland and Italy – and can be adopted in other European countries. Tourism is currently one of the fastest growing and most profitable industrial sectors in Europe, and plays and important economic role in the partner countries of the TTRAIN project: Austria, Finland, Iceland and Italy. It is expected that the tourist sector will continue its growth in the next years, but in spite of this, a lack of skilled personnel can be observed. The basic services provided by tourist companies are often in the hands of unskilled young people. In order to meet the requirements of a competitive tourist sector more qualified service personnel is needed. The TTRAIN project aims at improving the qualifications of unskilled employees in the tourist sector by creating a strong and comprehensive learning model for vocational instructors who provide on-the-job-training. These trainers will be enabled to provide fellow employees with education and training at the place of work. Continuous training and lifelong learning are needed in all partner countries for all sorts of positions in the tourism labor market, taking into account the necessary skills to be developed for the different positions. The primary objective of the project is to create, test and implement a learning model/curriculum, which will meet the requirements of the specific situation in each partner country and which can be adopted in other European countries. This learning model will be based on a well-proven methodology for training on-the-job-trainers in retail, services and other industrial sectors. One of the key elements of this methodology named “Stepping-stones” are the specific requirements in adult learning. Despite the general requirement of enhanced vocational training and education of unskilled tourist service personnel in most European countries, the situation differs from one country to another. Both the structure of the educational system and the structure of the tourism sector vary. In parallel to the elaboration of the learning model partners will therefore carry out a gap analysis in order to map and compare the needs and requirements of the tourism industry in all partner countries.